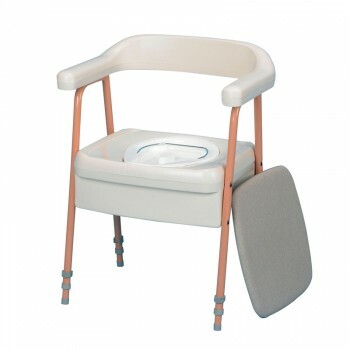 One of our more deluxe adjustable commode chairs, this model looks like a normal chair when not in use (the pan is concealed from a casual glance). The frame is height-adjustable to make getting up and sitting down as easy as possible and it's as comfortable as a chair or as a commode. A pleasant, casual design means this model looks good in any room. Of course, it's not all about style, this commode chair is also highly functional. The plastic pan has a lid and carrying handle for easy, discreet removal. It's easy to adjust the height but steady and secure too. Ideal for use in my bedroom as my bathroom is downstairs and I struggle with the stairs a bit , tucks out of the way and it dosen\'t look like a commode , just like a bedroom chair.